Medical science is taking away the questions about relationships between overweight or obesity and lifespan; on December 2, 2010 the New England Journal of Medicine, published a study of nearly 1.5 million people. In short, the study found that excess weight shortens lifespans. For those of you that prefer a longer lifespan, possibly some of you are thinking that you'd like to take off some weight and get your BMI down in the range of 20.0 to 24.9. As you have likely figured out, there are almost an unlimited number of ways to lose weight. What all successful weight loss methods have in common is that over a dieting period, you consume fewer calories than it takes to move your body and to do all the functions that your body needs to do to keep you alive. The bottom line is eating less and exercising more. The line below the bottom line (the sum of subtotals, not just a subtotal weight loss at one point in time) is the real crux of it: practicing weight management methods that you can continue using to keep the weight off after the initial dieting period!!! I love the story of Tony Posnanski! He used the Boring Tortoise Technique to lose weight over a longer time period, but he is actually keeping it off after that! Having said that the bottom line is eating less and exercising more, obviously there are healthy ways (Mediterranean-style of eating, for example) and not so healthy ways. A prime example of the latter is Professor Mark Haub of Kansas State University’s junk food diet, on which he successfully lost 27 pounds in 10 weeks while eating 66% of his calories from junk foods. In the 1980’s, I was the director of a medically supervised very low calorie weight loss program, designed for morbidly obese patients. During the five years that I directed the program, it never ceased to be a disappointment for me that the results didn’t stick. I had so much difficulty convincing the patients that losing the weight was not the critical step. Learning how to maintain the weight loss by exercising more and creating new eating habits were the decisive skills that were essential to maintaining their new lower weight. It was fairly discouraging to witness the exuberant patients who had lost so much weight, go forth and put the weight right back on. So many patients wrongly believed that they would never overeat again once they lost their excess weight. Because dedicating one’s self to a new exercise routine and modifying your eating style takes considerable effort and does not deliver an almost instant result, it is not exciting or attractive – nor does it sell many books or become an Oprah split second success. But losing weight on Twinkies or eating next to nothing (500 calories/day) on an HCG (human chorionic gonadotropin) diet, which often promises 30 pounds of weight loss, a month, sounds absolutely intriguing – it’s so attractive! Note: The HCG diet brags about one of the benefits is that there is “no exercise” necessary. No foresight for what comes later. Reading about a new study published in the New England Journal of Medicine (NEJM) on November 25, 2010 (ironically a weight-loss study published on Thanksgiving Day) reminds me of how complicated the entire program -- eating to maintain health and a healthy body weight – can seem to the general public. The researchers of the large European study published in NEJM found that a high-protein, low-glycemic-index diet worked best for maintaining weight loss. The subjects originally lost their weight on a very low calorie diet (800 calories/day). The researchers divided a large number of overweight dieters into several different diet groups. Each group had an average of 34 BMI - Body Mass Index. A BMI of 34 is technically well into the obese rating. Results showed that the group put on a high-protein, low-glycemic-index diet had a better chance of staying on the plan and maintaining the weight loss. What caught my eye, however, was the report that the researchers conceded that many people do not understand just how to achieve such an eating plan. If even the researchers recognize that people have difficulty with a complicated calculation concept like glycemic index; then maybe a different method to accomplish the same outcome would be a better choice for the general public. If you frequent this blog, you may have noticed that I don’t usually write about glycemic index. While eating low glycemic index foods can be related to good results, as this study shows, I have never suggested it in these blogs because of the complexities involved. One issue is that a low glycemic food is not necessarily a healthy food; for example, whole grain old-fashioned oatmeal has the same glycemic index as a chocolate bar. Another problem is that when foods are eaten as a meal, or ingredients are mixed together, the results are not necessarily an average of the foods/ingredients. Given these complexities, how would an eater at home who does not have a technician standing by the table to calculate the glycemic values for the foods selected ever know what the foods are going to do to him or her? What will these foods do to your blood sugar and ultimately to your weight, your visceral fat, your heart disease risk and so on. In addition, individuals vary in how rapidly food is digested into glucose (as measured by a glycemic index). The readers of this blog know that we authors spend considerable effort in guiding those with diabetes and weight management issues toward using whole foods. Fiber, fat and protein are all involved in slowing the release of glucose from the foods that we eat. There go those complex calculations again! What I am suggesting here is that most people do not need to have a hand-held pocket instrument with the latest app constantly in their hand, trying to figure out the glycemic index of their diet. My advice is to put away the pocket calculators and concentrate on which whole foods you are including and which refined foods you are leaving out. It seems much easier for me to encourage you to eat, a large variety of whole foods than to track individual nutrients or complex indexes. Select vegetables, fruits, whole grains, nuts and legumes, extra virgin olive oil or canola oil, and moderate amounts of low fat animal protein, like yogurt, milk, fish, poultry and lean red meat, if desired. In addition, we at Dr. Grandma’s have also spent substantial effort in trying to steer you away from nutritionally impoverished, sweet, salty, fatty processed foods; saturated fat-filled hard cheeses; processed meats; sweeteners with calories; and white flour products of any kind. My decision to steer clear of the glycemic index, even though it has value in research and theory, is based upon a plethora of practical research with whole foods. This decision is also consistent with the well-researched Mediterranean-style of eating. An interesting point is that the Mediterranean-style of eating is essentially, taking advantage of the glycemic index. So if you want to lose weight and maintain what you lose, consider eating as the people of Crete did in the 1950’s – declared the healthiest people of earth at that time. 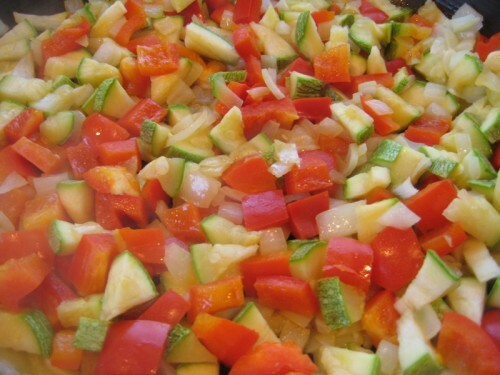 Start by increasing the amount of non-starchy vegetables in your meals. You’re not subtracting anything yet. Start moving! Gradually do more moderate exercise than you have been doing. Gradual increase is especially important if you have not exercised for years. You may be well advised to talk to your physician, if it has been decades. Do what you like and do it 6 – 7 days per week. Walk 4 – 5 days per week and do strength training 2 days per week. This builds metabolically active muscle tissue which helps you to maintain weight loss. After you are getting in the habit of eating large servings of vegetables, you may want to assess the serving size of the animal protein. Most people do not need more than 3 oz. of animal protein (about the size of a deck of cards); white fish can be double that size. Begin cleaning out the cupboards; give away the chips, dips, candy, cookies and white flour products – begin stocking your shelves and refrigerator with whole plant-based foods. Read some of our past blogs on impoverished processed foods. Get rid of them! Reduce your portion sizes, use smaller plates and glasses – it can help. The bonus of losing weight this way is that you do not have to feel or be hungry or deprived. The boring tortoise technique does not have boring results! Begin to make a change that will last your lifetime. Long lasting results are not at all boring. If you have gained back hard-earned weight loss; you know this is so true. You will finally join Tony Posnanski and those of us who happily have given up being hungry, yo-yo dieting, and feeling and being deprived. If you decide to eat more vegetables, this is one idea of thousands. 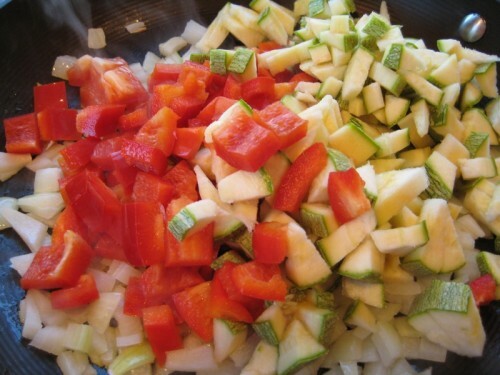 Just adding three vegetables changes an animal-based meal to a vegetable-based meal. Lots of food for fewer calories for the same volume of food. 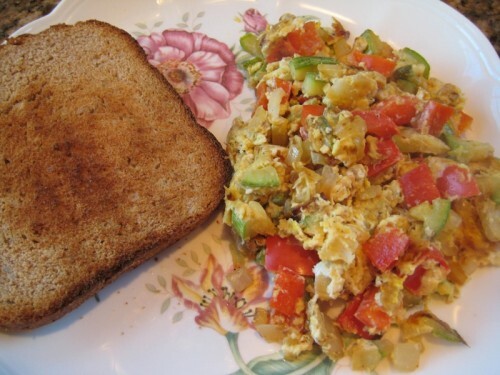 I make this style of scrambled eggs with many different vegetables including: broccoli, mushrooms, and spinach. 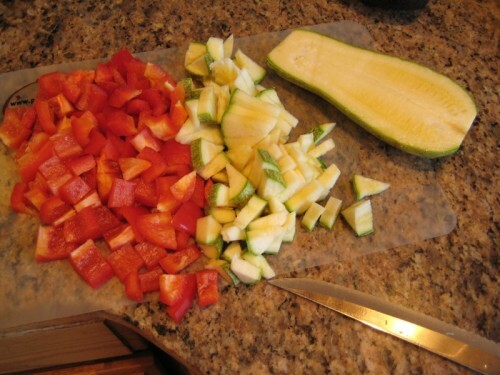 The pictures below were a mix of onion, red pepper and a white zucchini squash. I served with a little avocado and my homemade 100% whole wheat toast. This is a big healthy breakfast that will carry you through the entire morning. Caramelize onion until light brown. 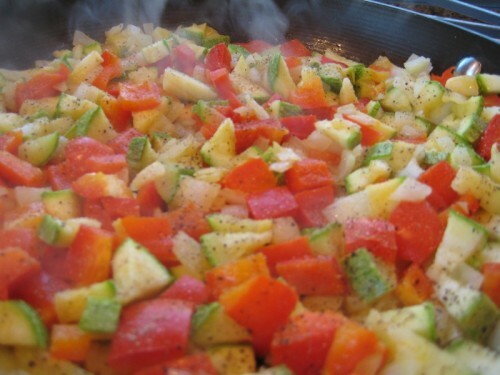 Add Pepper and zucchini and saute until tender. Salt and pepper to taste. 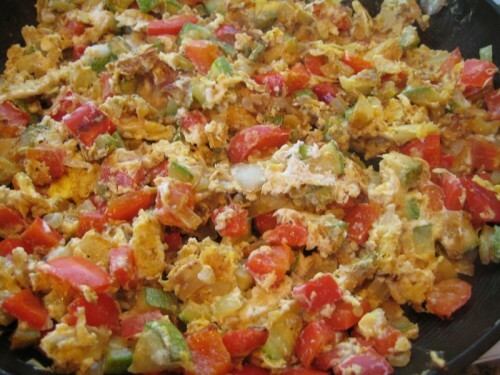 Break eggs onto veggies, then scramble together until the eggs are solid. 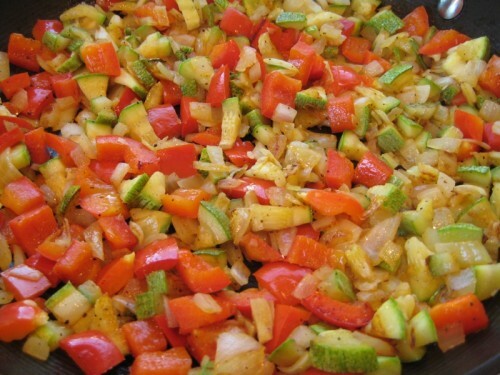 Add red peppers and squash to the onions. When the veggies are tender lower the heat a little. 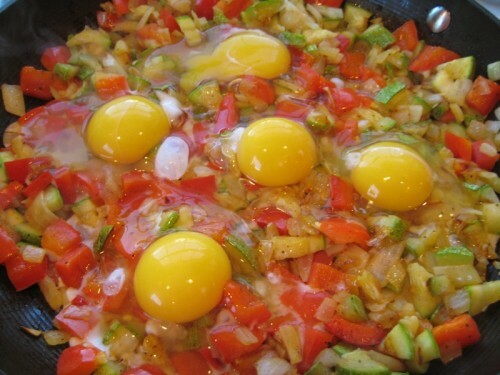 Add eggs right to the top of the tender veggies. Scramble over medium low heat until eggs are solid. Served with my homemade 100% whole wheat toast. Hi Joyce! It’s Trish (Burr) Nicholls. I found your site as a result of reading about Troy. My sincerest prayers are with you. His early departure from us is so sad to me because he was such a wonderful young man and a sweet spirit. I hope you are dealing well with your bereavement. I am so happy to see your wonderful site and read about your success! I am finishing my doctorate in Clinical Psychology this coming spring. It’s so good to see the light at the end of the tunnel. I have applied to BYU for an internship position, so there’s a chance I’ll be in your neighborhood in the near future. I’d love to hear back from you and reconnect, if you’d like to do that. My e-mail is: gammanicholls@comcast.net and I’m on facebook as Trish Dougherty Nicholls. Take care Joyce, I am keeping you in my prayers. Thank you so very much for the kind words for Troy, he was a wonderful human being and son. We’re doing pretty well, thanks. Our best to you and your family – I’ll write to you at home.